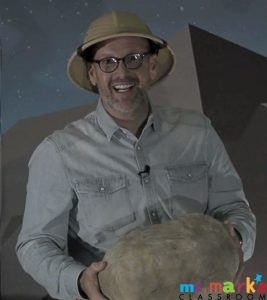 Boulders- The large boulder in the video is created by taping shut an empty box. Be sure to think ahead how large you want the rock to be and where you will store it. When making a rock this wonderful, you want to be able to store it for future use. Next, wad together newspaper and tape the wads to the box be sure the bottom of the box remains flat. Use Modge Podge to dip torn strips of brown craft paper and apply to the box until completely covered. Allow the rock to dry completely before sponge painting. Painting is optional. Spray Foam Rocks- Use the spray foam insulation to create rocks like I demonstrated with the fire pit construction. Review the steps as pictured to refresh your memory. I have learned that creating larger rocks requires longer drying times and adding more spray foam insulation. Just know you need time to build the rock due to drying time since the weight of the foam does not allow the larger rock to expand as well. Using small boxes or balls could be a great help and reduce the amount of spray foam insulation. Budget savings in the making! Paper Bag Rocks- This may be the simplest rock yet. Use brown grocery bags with no printing. If all you have is printed bags, turn them inside-out. The bag will sit upside down on the floor. Crumple the bag down making sure the points of the corners are smashed in and the bag is mounded to your liking. 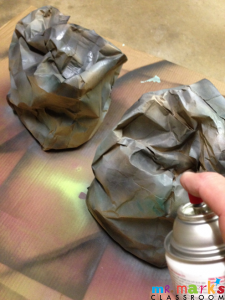 Spray paint the rock with browns, grays and other colors you might have on hand. Using lime green paint to resemble moss is great or glue on moss if you’re an over-achiever. There is still time! Mr. Mark’s 10-Day Giveaway is nearing the end! 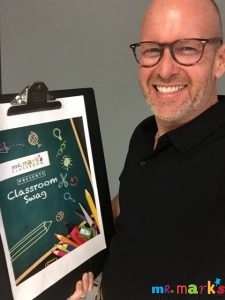 with your subscription to Classroom Swag!